The year 1995 is a significant landmark in Split cultural history, which marks the 1700th anniversary of the year when Roman Caesar Auerlius Gaius Valerius Diocletianus engaged him in the erection of the spectacular palace in Splt, where final stage of his life was spent. 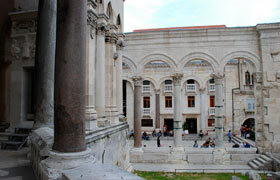 The Diocletianus palace is one of the most eye catching marvels of Europe. Thus it historical and cultural elegance crosses borders and elevates itself as a historical attraction. The place was carefully preserved for its momentous history and enchanting charm. 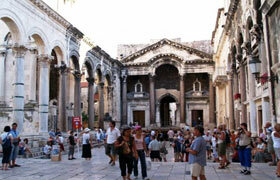 The enticing grandeur of Diocletianus Palace is situated in the very heart of old part of Split which charms visitors with its cobbled streets. The greater Split area is characterized by its lush vegetation and the greenery, particularly Marijan Hill on the west of the peninsula flauntingits aborginal forest. The city makes an ideal base from which to explore the islands,the scenic beauty and historic villages of central Dalmatia.